Did you catch all of these Sunfish in the same location? The reason I ask is because if the Pumpkinseeds and the Bluegills are in an isolated habitat together, there might be a slight chance that some interbreeding has occured. Here's what I suspect. In post #1 the 4th pic is more than likely just a nice female Bluegill. BUT the rest of these might be a type of hybrid. I suspect a Bluegill Pumpkinseed cross of some type. 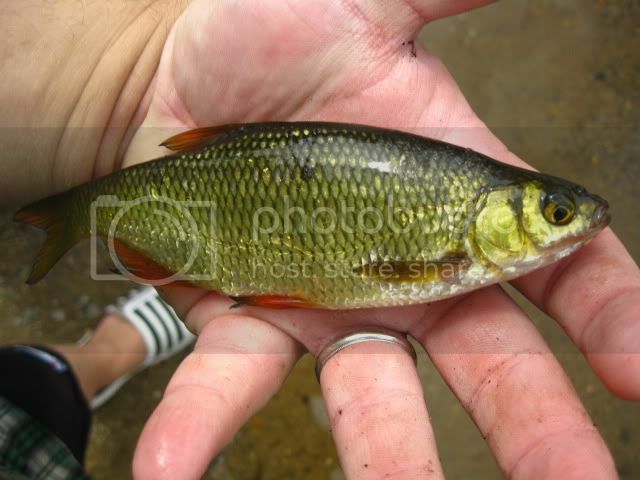 While most all of them look like an average Bluegill in terms of mouth size, body shape, and dorsal spines, they have a very unusual mottling and extremely Green appearance. Many male Bluegill that I've seen that are this size almost have a copper irridescence to them ,and these look to be very Green in their mottling, almost like that of Pumpkinseeds. 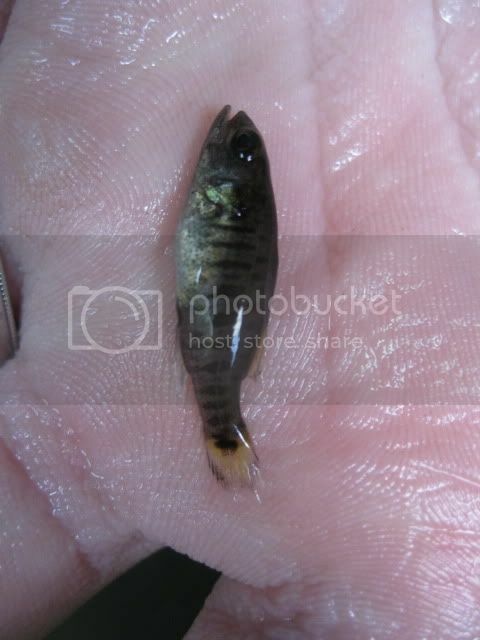 So with that said, all of the potential Bluegill photos MAY be some kind of BG/P-Seed hybrid, but I am not certain. Post #2 1st pic female BG if not a hybrid. Post #8 1st, 2nd pics female BG if not a hybrid. 3rd pic juvenile male. 4th pic Male. 5th & 6th pics male. 9th pics looks to be just a really nice large female Bluegill, but does not appear to have the same characteristics of what could be a hybrid. Post #9 1st pic Male BG if not a hybrid. 2nd 3rd & 4th pics nice Pumpkinseed. Post #27 3rd 4th 5th & 6th pics Male BG if not a hybrid. Post#28 5th pic Male BG if not a hybrid. Post #29 1st pic Pumpkinseed. 2nd & 3rd pics Brown Bullhead. 4th & 5th pics Pumpkinseed. 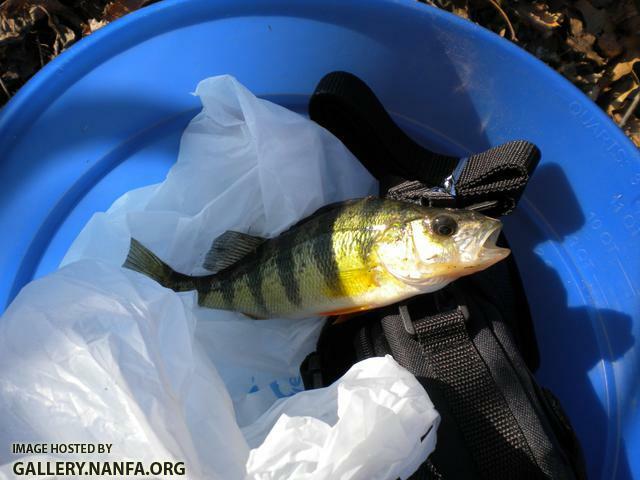 Post #36 1st and 2nd pics Yellow Perch. I hope this helps. I have captively kept Bluegills, as well as Green, and Longears, and these don't look at all like any of the Bluegill/Green Sunfish hybrids that I've seen a lot of ponds stocked with either. I'm guessing that if what you are catching isn't just plain ole' Bluegills, then the Bluegills and Pumpkinseeds are intermingling. I definately don't think any of them were Green Sunfish, Red Ear Sunfish, or Longear Sunfish though. Excellent pics by the way!!! and GREAT JOB too! The more I look at your photos, the less likely I am inclined to say that hybridization has occured. I think what you are catching is just some really beautiful and healthy Bluegills. That GREEN color is absolutly remarkable, and unlike most large Bluegills that I have seen, but I think you've got yourself Bluegill. The photos are superb though. You can see every last detail of color, and usually most pics don't show that off as well as your photos do. Absolutly fantastic job. thanks ben!! all the BGs and PS were caught at different locations although the ones with the dark purple are all from the same spot. Cool pics from the cape, i wish i was their The day you got the flounder. Can the crab be identified (did you eat the crab). I had a fun time sampling the herring river with you. 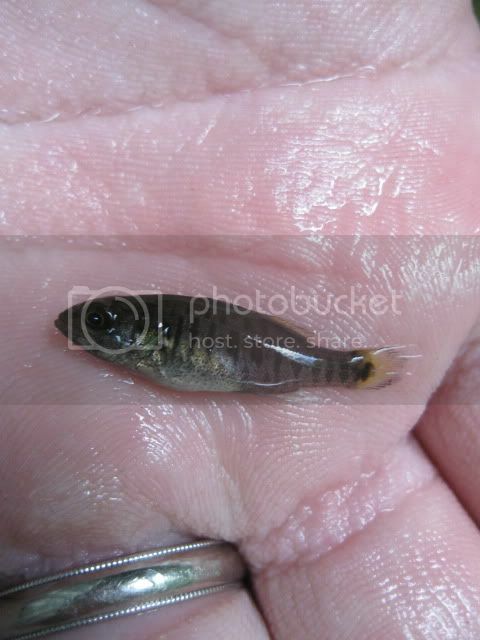 (I was the one holding the killifish, the eel was in my bucket). Oh, i caught a fallfish the other day that made the noise you mentioned hearing. I caught bullhead that made noise before too. Since sound travels better through water than air i wonder if fish use these sounds in the wild. i didnt eat the crab...i dont eat seafood or fish. lol. yeah i wonder about the sounds as well. Edited by donkeyman876, 04 August 2009 - 07:43 PM. all right. got some pics from when i went out with josh. look at how gold this one is compared to the post before. 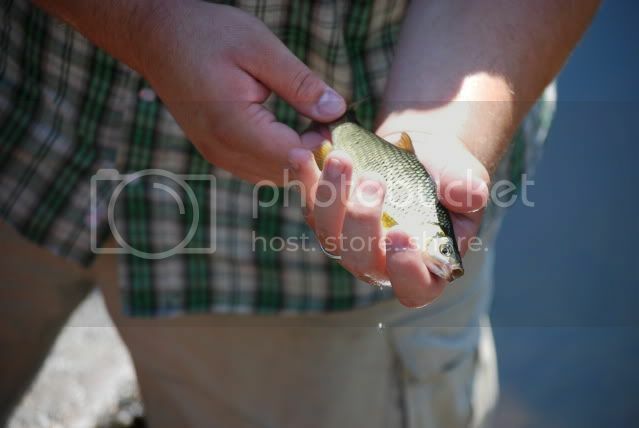 Awesome pics, I am noticing details in the photos I never noticed when the fish were caught. Look at the red on the golden shiners fins, I wonder if that is breeding colors. 24" of largemouthed fighting power. That lake has the healthiest bass poplulation I have ever seen. Pike lake by Mount Forrest Ontario. It's catch in release. From a canoe I can see the bass nests and they are over a meter wide! The fish are bloody huge!!! Edited by donkeyman876, 31 August 2009 - 07:01 PM. blackfish, no stripers yet though. 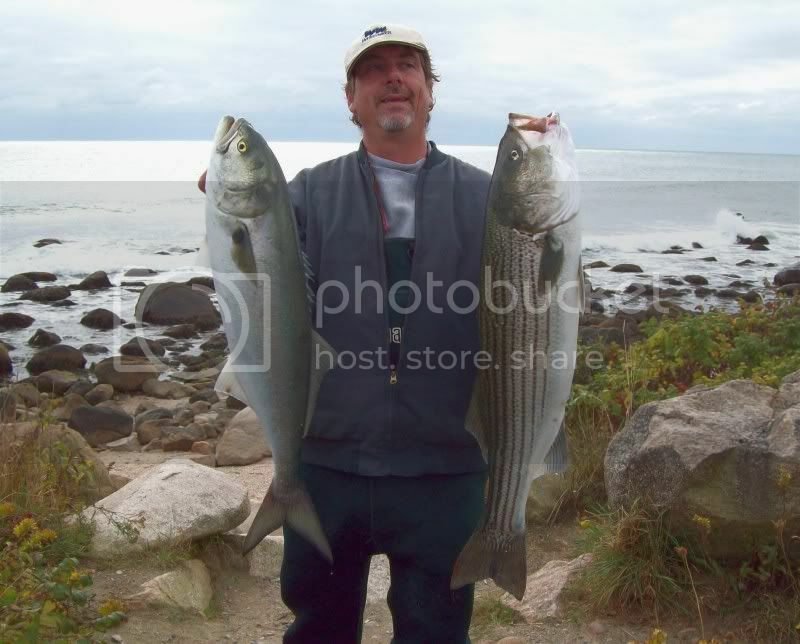 Big blues and stripers running in the high surf in RI. I miss bluefish... that's a nice, fat, healthy one. NICE FISH! What is your go to lure? The run on our North Shore of LI has been anemic. I'm going out today to see if the stripers are bitin. This look like a Micropterus to anyone else? Ok it's not a darter, it's a yellow perch and needs no IDing. 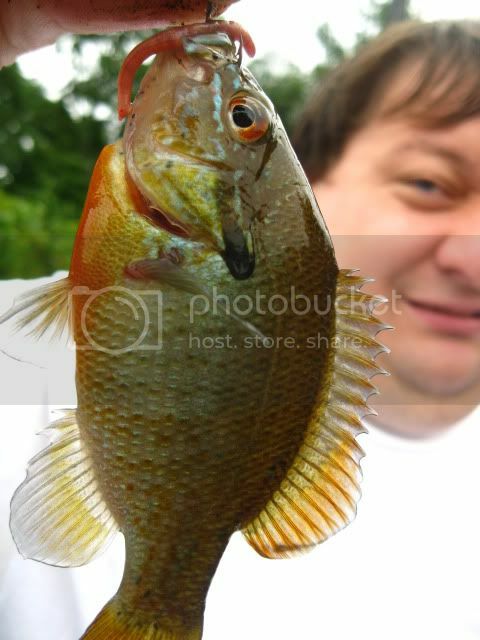 I wanted to show you fish from my minnow trap but it was empty, so instead i went fishing in the Connecticut River and got this perch. It's my first fish on hook and line since ice out so I took a picture of it instead. I wish I had more time in the day (well, technically the DAY has more time, but my weekday work schedule is 3 pm to 11 pm so my waking schedule is up by noon and feeling active by about 3) as I saw a stream whose water looked low enough to sample. I doubt it would have anything (my fishing experience showed only small brookies their and people say that it, being upstream from a waterfall on a mill dam only has trout), but still I think I will sample it if the weather is good next week. well if there are brookies in there, there would be the chance for some darters, would there not? One thing my New York experience has shown me is their is always a CHANCE for darters, though in this case I suspect a slim one. Tesselates prefer slower waters further down the drainage towards the main river, Swamps are found in a different drainage entirely. Though fish turn up where they don't belong all the time i doubt it will happen. More likely I will find cold water shiners or sculpins if anything at all different is their.